Here is an announcement on the forthcoming release of a new book on the Nilgiri Hills, one of south India's premier hill stations in 19th century. The book, Nilgiri Hills: Christian Memorials 1822-2006, is jointly researched and produced by Dr John C Roberts, social anthropologist in New York, and N P Chekkutty, senior journalist in Calicut. The Nilgiris which became a major station for the English and other Europeans from 1820s has burials of thousands of the English, French and Anglo Indians spread over various towns across the district. The South India Research Associates (SIRA) which carried out the two-year research program and is now bringing out the book offers a very attractive subscription offer. We wish to announce that we have completed our two-year comprehensive survey of cemeteries and isolated graves in the Nilgiri Hills and are going on-press this month for a February 15th release. We are printing only a limited edition of 250 copies. 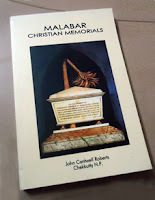 The quality will equal our Malabar Christian Memorials: 1723-1990. 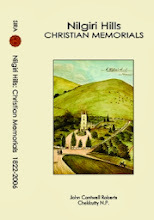 Nilgiri Hills Christian Memorials: 1822-2006 will be approximately 500 pages with full-color reproductions of historical images done in the Hills by Richard Barron, George Hutchin Bellasis, Edmund Lear, E.A. McCurdy, Samuel Ponsonby Peacock and Robert Pouget. It includes a detailed map of the location of the tea and coffee estates as well as the cemeteries. We offer a pre-publication price of Rs. 1000 to our subscribers. The price after release will be Rs. 1250. Postage outside India is an additional Rs. 500. If you wish to gift copies to anyone in India the postage is free. We thank you for your kind support in our voluntary endeavors. I have sent you an email Sir asking for details. And some pics of such graves in Bangalore - there are stories waiting to unfold. And culture to be conserved before the land is eaten up by land mafia!